Bracket for mounting grid or slatgrid panels securely to walls. Each panel should be mounted using 4 wall brackets. Screws directly into wall. Screws not included. Colors: chrome, black, white. Grid connector joins 2 grid or slatgrid panels together (use 3 connectors for every two panels). Most cost-effective connector available on the market. Colors: black, white, chrome. Holds four 2' wide grid or slatgrid panels in any height. Hardware to connect grid panels included. Black hooded casters included. Colors: chrome, black, white. Display gridwall base holds three 2' wide grid or slatgrid panels in any height. Black hooded casters included. Colors: black, white, chrome. Make a perfect free-standing display with these 24" wide legs for grid or slatgrid. Screws and levelers included. Sold in pairs only. Colors: black, white, chrome. Make a perfect free-standing display with these 24" wide legs for grid or slatgrid. Screws, casters included. Sold in pairs only. Colors: black, white, chrome. Make a perfect free-standing display that goes against wall with these 12" wide legs for grid or slatgrid. Screws and levelers included. Sold in pairs only. Colors: black, white, chrome. Compact grid display tower 55"H, base 12" X 15". Accepts gridwall faceouts to make single or double sided display. Color: black. Floor gridwall display panel with casters included. 69"H X 26"W X 24"D. Gridwall accessories sold separately. Color: black. Compact grid display tower 73"H, base 12" X 15". Accepts gridwall faceouts to make single or double sided display. Color: black. 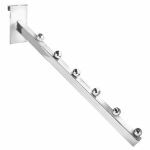 Straight bracket with lip works well with wood or glass shelves, accepts shelf rests and bumpers for glass shelves. Color: chrome. Straight bracket with lip. Accepts shelf rests and bumpers for glass shelves. Works well with wood, bullnose plastic shelves or glass shelves. Colors: black, white, chrome. Grid connector joins grids or slatgrid panels together at 90 degree angle to create triangular freestanding displays. Colors: black, white, chrome. Grid connector joins 2 grid or slatgrid panels together (use 3 connectors for every two panels). Heavy duty connection of grid panels. Colors: black, white, chrome. Sold only in full packs of 4. Price is for each shelf. Colors: black, white, almond. 24"L X 13"D shelf accepts 12" brackets. Sold only in full packs of 4. Price is for each shelf. Item#: BPS2413/CLFR Price: $18.50 per shelf Color: clear frosted. Gridwall hooks with 30 degree tip. Colors: black, white, chrome. Adhesive plastic hang tabs to use with pegboard hooks, slatwall hooks, gridwall hooks or on spinner hooks. Holds up to 14 oz. packaging. Color: clear. Gridwall picture hook holds any frame, poster. Colors: black, white, chrome. Gridwall waterfall 6-ball faceout, square tubing. Price: $2.95ea Colors: black, white, chrome. Plastic laminated shelves. Sold only in packs of 4. Colors: cherry, dark cherry, maple. Adjustable tilt straight 12" long bracket with lip. Accepts shelf rests and bumpers for glass shelves. Works well with wood, bullnose plastic shelves or glass shelves. Color: chrome. 10"L x 4"D gridwall flat display holds a single shoe. Color: clear acrylic. Gridwall display holds a single cap, hat or wig. Dimensions: 9"D, top disc 3"dia. Colors: black, white, chrome. 12" long gridwall faceout is primarily used for hanging merchandise. Colors: black, white, chrome. 12" long gridwall garment display arm. Disc end prevents hangers from sliding. Colors: black, white, chrome. 3" long gridwall faceout is primarily used for hanging merchandise. Color: chrome. 3" long gridwall garment display arm for hangers or display half-form. Disc end prevents hangers from sliding. Colors: black, chrome. 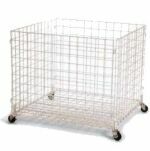 Gridwall baskets. Sold in packs of 6. Colors: black, white, chrome. Gridwall baseball hat holder can display up to 12 caps. Colors: black, white, chrome. 9"L x 2.5"W Gridwall slant display holds a single shoe with toe stop. Display can swivel in any direction. Color: clear acrylic. Gridwall waterfall 7-tube faceout, rectangular tube, upscale rectangular tube. Dimensions: Slant arm - 15.5"long; protrudes from the back 14"long horizontally. Colors: black, white, chrome. Gridwall faceout sign holder is 7" High X 11" Wide. Ideal for displaying prices, promotions. Colors: black, white. Gridwall faceout sign holder is 7" High X 11" Wide. Ideal for displaying prices, promotions. Color: chrome. Universal CD shelf can be hung on slatwall, pegboard or gridwall/slatgrid. Tilted back design. Colors: black, white. 24"long x 1-1/4" diameter straight hangrail for hangers, connects to 2 opposite gridwall panels facing each other. Colors: black, white, chrome. Round tubing hangrails for hangers. Colors: black, white, chrome. 48"long x 1-1/4" diameter straight hangrail for hangers, connects to 2 opposite gridwall panels facing each other. Colors: black, white, chrome. Slatwall, gridwall, pegboard bracket to hold styrofoam head. Color: silver grey. Rectangular tube hang rail for clothing hangers. Color: chrome. Floor 3-sided display unit includes: 3 gridwalls, base with casters, connectors. Accessories sold separately. Colors: black, chrome, white. 36"wide Floor 4-sided display unit includes: 4 gridwalls, base with casters, connectors. Accessories sold separately. Colors: black, chrome, white. 48"long x 24"wide Floor 4-sided display unit includes: 4 gridwalls, base with casters, connectors. Accessories sold separately. Colors: black, chrome, white. "One-Piece" compact grid display tower comes complete with grid 72"H X 14"W, base and casters. Overall 76"H x 24"W. Color: black. 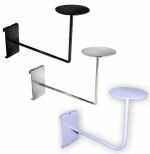 Perfect free-standing display which can accept gridwall hooks: 2", 4"long hooks, picture hooks, hat display. 12"wide x 18"H x 8"D. Legs protrude 4" on each side of grid. Colors: black, white. Counter free-standing display with 12 pcs of 4"long gridwall hooks. 12"wide x 18"H x 8"D. Legs protrude 4" on each side of grid. Colors: black, white. Oval baskets, made of dark brown willow, oval support grid bracket included. Color: dark brown with bronze bracket. 18"H mannequin display head, makeup, eyelashes, pierced ears, with pegboard/slatwall holder. Choose more mannequin head displays here. Color: fleshtone. 21"H mannequin display head, makeup, eyelashes, pierced ears, with pegboard/slatwall holder. Choose more mannequin head displays here. Color: fleshtone.